Join a Co-Op - Join a Farm Co-op or a Community Supported Agriculture (CSA) group. You can purchase a share in a local farm and in exchange, you'll get a portion of the food that the farm produces. You can find an organic co-op or CSA in your area by going to Local Harvest.org. Buy in Bulk - Warehouse stores like Sam's Club and Costco have great deals on organic produce. Go shopping with family members or friends so you can share the cost and split the merchandise. Find Coupons Online or at Natural Grocery Stores - Earthbound Farm has coupons on their site. (You have to take a quiz in order to get a $1.00 coupon.) My local Whole Foods sometimes has coupons available inside the store. Also, check out Mambo Sprouts for online coupons. 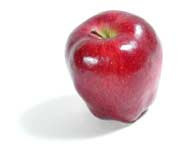 Look For Low Cost Produce - Search for reduced prices on produce that needs to be used right away. I often find bags of organic spinach and veggies at Kroger that need to be used within 1-2 days. They are sometimes 50-75% off the original price! Check Circular Ads - I've noticed that some local grocery stores advertise sales on organic produce. Walmart and Meijer have sales on organic produce often! Grow Your Own Produce - Plant an organic garden in your yard. You can even grow some veggies on your windowsill if you don't have space for a garden. You may spend a little more for organic seeds, but you'll save money in the long run! Shop Locally - You can find lower priced organic fruits and vegetables at local Farmer's markets. If you don't have any markets in your area, then look for locally grown organic produce at your grocery store. The price of local produce will be lower since they don't have far to travel. 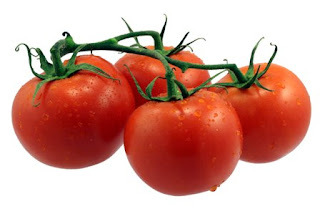 Buy Produce That's in Season - All produce is less expensive when they are in season. The Environmental Working Group (EWG), a nonprofit organization based in Washington, D.C., released their 5th annual "Shopper's Guide to Pesticides" on March 10th, 2009. The Shopper's Guide to Pesticides is a tool that will help you identify fruits and vegetables that are the most susceptible to pesticide residue. 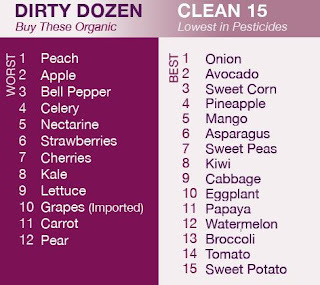 Choosing organic for the produce determined as the “Dirty Dozen” can reduce pesticide exposure by up to 80 percent. You'll notice that fruits and vegetables that have thin skins are more likely to have a higher amount of pesticides. The "Clean 15" are fruits and vegetables that have the lowest levels of pesticides. Since buying organic may not be feasible if you're on a tight budget, stock up on the "Clean 15" more often. Remember that you need to incorporate fruits and veggies in your diet for necessary nutrients! The Organic Center also has a Pocket Guide for reducing pesticide dietary exposure - It is more extensive and considers the pesticide exposure to farmers, citizens and wildlife who live near farms that use harmful pesticides. A food that has a "100% organic" label will have no synthetic ingredients and can legally use the USDA organic seal. A food that is labeled as just "organic" has to have at least 95% organic ingredients and can use the USDA organic seal. A food that has a label that says "made with organic ingredients" must contain at least 70% organic ingredients with strict restrictions on the remaining 30% including no GMOs (genetically modified organisms) . This food can't legally use the USDA organic seal. Products that use less than 70% organic ingredients are able to list organically produced ingredients on the side of the package, but aren't able to put organic claims on the front of the package. Try to eat a variety of foods from various sources. Stop spending money on those 100 calorie packs and start making your own healthy snacks! Buy some snack bags and portion out snacks like fruit, veggies, nuts, dried fruit and whole grain crackers ahead of time. Plan ahead by keeping a variety of nutritious, ready-to-eat snacks on hand at home, at work or whenever you need something when hunger strikes. When you're prepared, you won't have to buy snacks from vending machines, convenience stores or fast food restaurants. Snacks can contribute to a healthy diet! Choose a variety of nutrient dense snacks in small portions. Make sure to make snacking a conscious activity though. You can overeat easily while watching TV, surfing the net or doing other activities! 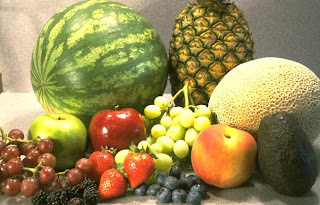 Fruits and vegetables provide a feeling of fullness with little to no fat and very few calories. 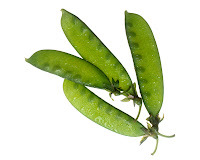 They provide important vitamins, minerals, fiber and other nutrients. 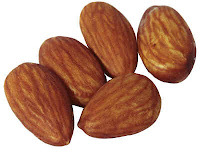 Nuts and seeds provide protein, so you'll feel fuller longer. They can be high in fat, but the fat is mostly monounsaturated. 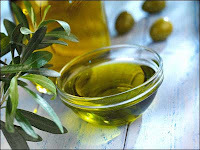 Monounsaturated fats (MUFAs) lower total cholesterol and LDL cholesterol (the bad cholesterol) while increasing HDL cholesterol (the good cholesterol). Nuts and seeds are high in calories, so watch your portions! 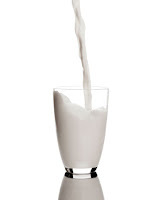 Low-fat dairy products are good sources of calcium and protein. They are also rich in many other vitamins and minerals. Dairy products can be high in fat, so choose low-fat products. Protein rich snacks like beans, soy and hard-boiled eggs will fill you up and keep you energized. *I will update the snacks often! I'm just starting with a few snacks today. Now you can mix everything up! 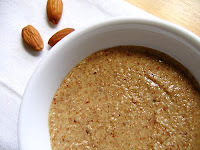 Put some almond butter on whole grain crackers or make your own trail mix with raisins and nuts! Have you ever wondered why there are stickers on your produce and what they really mean? Price Look-Up codes, or PLU codes, are identification numbers put on produce and other products to make check-out at stores faster and more accurate. You’ll be surprised to know that those stickers can also tell you whether or not a product is organic or conventionally grown. The first step is to count the number of digits on the sticker. 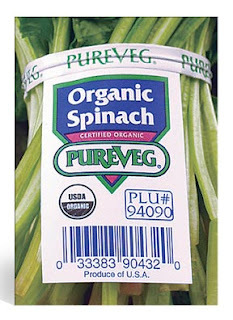 Below: A PLU code of 94090 on a bag of organic spinach. Quinoa - A Super Food! Quinoa (pronounced keen-wah) refers to the seed of the Chenopodium or “Goosefoot” plant. It is native to the Andes Mountains of Bolivia, Chile, and Peru and was a staple food of both the Aztecs and the Incas. Quinoa is technically not a grain, but is used as a grain and substituted for grains because of its cooking characteristics. Quinoa is now available in many forms such as pasta, cereal, flour and even polenta. Why is Quinoa considered a super food? Quinoa is a considered a super food because it contains more protein than any other grain. The protein in quinoa is complete and contains all nine essential amino acids. It is especially high in lysine, methionine and cystine. Quinoa is rich in iron, calcium, riboflavin, potassium, B6, niacin and thiamin. It’s also a good source of manganese, copper, zinc, magnesium, phosphorus and folate. Another great reason to eat quinoa is that it’s high in dietary fiber. Quinoa is a gluten-free whole grain food, so people who are on a celiac diet can safely use it. The American Celiac Sprue Association lists quinoa as a good choice for a gluten free diet. Additionally, quinoa is the perfect food for vegetarians and vegans because of its high protein content! 1/4 cup of cooked Bob's Red Mill Organic Quinoa Grain has 170 calories, 2.5 grams of fat, 2 mg of sodium and 7 grams of protein. Quinoa kernels have a waxy protective coating called saponin which leaves a bitter taste. Quinoa should be rinsed under running water before cooking to remove the saponin. Many manufacturers now rinse quinoa before packaging, but it still should be rinsed just in case there is some saponin remaining. Quinoa expands up to 4 times its volume when cooked and has a mild, nutty and earthy flavor. It tends to takes on the flavors of the food it's cooked or served with. To cook, use two parts liquid to one part quinoa. Bring the quinoa to a boil using a medium saucepan, reduce to a simmer, cover, and cook until the grains are translucent and the germ has spiraled out from each grain. It has a crunchy texture when cooked for about 10 minutes and a soft and chewy texture when cooked for about 15 minutes. Quinoa tastes great in soups, stews, casseroles, stir fries and even cold in salads. A Fun Nutrition Quiz from the Dole Nutrition Institute! Are you a Nutrition Novice or a Produce Pro? I also like the video below from monkeysee.com. A Registered Dietitian explains food labels in detail. There are 8 segments, so make sure to click the "Next Segment" button after each video is finished. It will take you to the monkeysee.com site after you watch the first video. Today is Registered Dietitian Day! Print out this informative pocket guide from the Face the Fats website (By the American Heart Association.) You can take it with you when you're shopping, eating at a restaurant or use it at home when you're cooking up a healthy meal! Take a short quiz by the American Heart Association to test your knowledge about specific fats! Test Your Fats IQ Now! Who wouldn't be happy to learn that a small amount of cocoa and dark chocolate may actually be good for your body? The Aztecs were way ahead of us! Cocoa beans are full of plant chemicals called flavanols. Flavanols are antioxidants that may reduce blood platelet stickiness and help prevent blood clots. According to the American Dietetic Association, Cocoa and dark chocolate may actually have up to 10x more antioxidant power than other antioxidant rich foods! 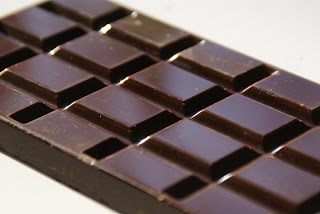 Cocoa and Dark chocolate can be a good source of calcium, potassium and magnesium. Chocolate even contains vitamins A, B1, B2, D and E. The vitamins and minerals found in chocolate products can vary depending on the way the chocolate was processed. Rate your eating habits with this quiz by the American Dietetic Association (ADA): Are you "eating right?" National Nutrition Month® is an annual nutrition education and information campaign sponsored by the American Dietetic Association. The campaign helps increase awareness of the importance of good nutrition and physical activity. Step Up to Nutrition and Health - This fact sheet focuses on the importance of eating right and being physically active. Print it out and share it with your family and friends! Also, March 11, 2009 is Registered Dietitian Day!